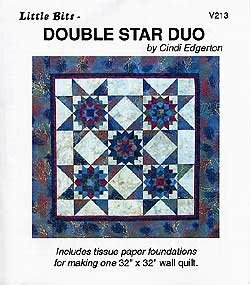 Double Star Duo pattern includes instructions and tissue paper foundations for making one 32" x 32" wall quilt. Mix and match your fabrics within these variations of the traditional Carpenter's Wheel block to give each block in the quilt it's own look. Lots of fun, and easy to do.